It has become an essential part of our everyday life. It makes everything easier, faster, more efficient. We might not even notice it nowadays, so much are we used to its presence in our routine. Artificial Intelligence plays a great role in most of our activities online – from doing groceries, ordering a ticket to a movie or watching videos, to asking our smartphones what the weather will be or which route is best to take to avoid that long, irritating traffic jam you face every morning on the way to work. AI is built to take into account how people think, act and communicate with a computer – it is not only computer science, but also psychology, linguistics, logics and philosophy. Artificial Intelligence is also becoming a key element for business success, as it allows many companies to increase their revenue, profits and competitiveness. Recently, a report commissioned by Microsoft concluded that Dutch companies are leading the way in Artificial Intelligence in Europe. The report compared the application of AI within nearly three hundred European companies. It is used by at least 22 Dutch companies on different levels, for example AkzoNobel, BAM Group, Coolblue, Philips and Randstad. It is often discussed at management meetings, and within about 37 percent of companies Artificial Intelligence initiatives can be described as advanced. According to Microsoft’s Chief Legal Officer, Brad Smith, as soon as clear ethical and legal guidelines are developed, the Netherlands has the potential to become world leader in the area of Artificial Intelligence. Among the main areas in which AI is applied are automatic learning, automatic text analysis and neural networks. A slightly smaller impact of AI is seen in virtual agents, speech recognition, computer vision and biometry. In addition to that, it is part of many smaller everyday tasks, for example creating efficient schedules for employees. Most of the companies that took part in the survey expect that Artificial Intelligence will improve their business operations and customer service by partly automating it. 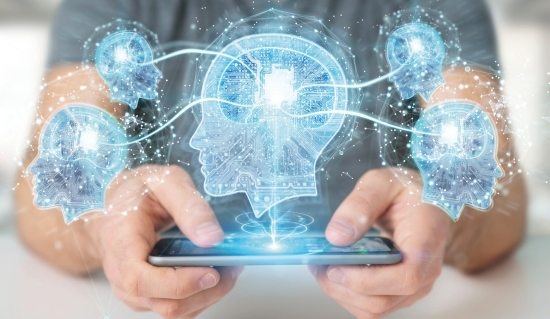 59 percent of companies think that because of the larger implementation of AI into their day-to-day practices, their staff members will have more time to focus on interesting matters instead of having to complete mundane tasks. The high qualifications of Dutch IT specialists are appreciated worldwide, which means that they are often hired by international companies, both in the Netherlands and abroad. Corporations like Google, Amazon, Facebook, Microsoft, IBM, Nvidia, Bosch and Volkswagen are especially popular among AI specialists. This trend has led to a so-called “brain drain” – a situation in which Dutch universities lack specialists and researchers in the area of Artificial Intelligence, because they have been hired by other companies. In July it was even discussed that universities had to create more restricted criteria for entry, in order to limit the number of students in Artificial Intelligence, due to the lack of qualified teaching staff and the high number of applicants. The discipline is part of multiple courses, such as data science, computer science, business analytics and applied mathematics. It’s difficult to find exact numbers and create clear statistics, because universities don’t usually register where graduates work after they finish their studies, and Artificial Intelligence is a very common term that is used in multiple disciplines. Still, it is clear that there is a shortage of personnel. At Eindhoven University of Technology, for example, there are currently eight vacancies for AI-related studies that are difficult to fill. Similar problems exist at TU Delft, Leiden University and the University of Amsterdam. The EU is actively trying to catch up in the race for talents, where countries as China and the US are currently leading the way. One way of doing so is by investing 1,5 billion euros into Artificial Intelligence research, in the hope that this will encourage European professionals to work in Europe. In addition to that, top European institutions are joining their efforts to create a network that will conduct a variety of research projects into AI.